Finding exotic granite in the Columbus area isn’t always easy, but we have a wide selection of options. 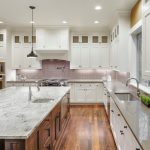 Granite countertops have been the top choice for most homeowners over the last few years, but a new option is taking the residential construction and renovation industry by storm. Exotic granite is the latest thing, with bold colors and eye-catching patterns that will help your kitchen and bathrooms stand out. Finding exotic granite in the Columbus, Ohio area isn’t always easy, but our team at The Granite Guy has a wide selection of options. If you’re tired of looking at the same few granite samples that it seems like everyone else already has in their homes, visit our showroom to see more than 80 large slabs. It’s easier to choose your exotic granite when you can view more than a tiny sample, which is why we keep full-size slabs in our store for customers to view. Looking at a square measuring only a few inches in size doesn’t give you a great idea of what the slab will look like when it’s installed in your home. This is especially true of exotic granite options, which tend to have larger patterns and more colors throughout the stone. We’d love to show you some of the options and help you choose a type of granite that will work well in your home. Along with exotic granite, you can shop a wide selection of other natural stone options here at The Granite Guy. These options include quartz and marble, which are some of the most luxurious types of countertops available. The Granite Guy is your go-to for design and installation of quality countertops, so contact us today for a free estimate.